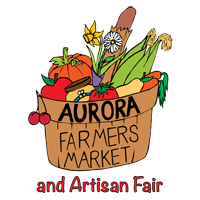 Another beautiful spring day has come and gone at the Aurora Farmers’ Market and Artisan Fair. Once again, we were busy with customers enjoying the day and the growing array of produce becoming available. Next Saturday is our annual Strawberry Fest and we are expecting several of our farmers to have the first strawberries of the season, which will most certainly bring out the crowds. Our long time vendor, Andy Sampogna, of 19th Avenue Farm, now known as Farm 2 Home, will be arriving at the Market and will be located at the far end of the south pathway near the Larmont Street entrance. He will have a smaller booth than previously but he always has an interesting selection of produce. With his arrival, our complement of full time vendors is complete, although we will still be accepting applications from part time people and the occasional one day vendor. Now it is my pleasure to tell you about one of our community partners, Garden Aurora. They were incorporated on April 23, 1918 as the Aurora Garden and Horticultural Society by members including W.H. Fleury and Thomas Sisman. They are now called Garden Aurora. This is a big year for the club. Their first opportunity to celebrate was to host 250 gardeners from Toronto’s Eastern Beaches to the south shore of Lake Simcoe for an Ontario Horticultural Association annual event hosted in turn by all the clubs in District 5. Guest speakers included Aurora’s own David Tomlinson as well as Mark and Ben Cullen. A highlight of the evening was a special greeting from Prime Minister Justin Trudeau. Their next event was the very successful annual Plant Sale at Aurora Home Hardware featuring much loved plants from members’ gardens. The huge numbers of people and young folks who came to the sale has given the club much optimism about the future of gardening in Aurora. They were able to promote the sale the previous weekend at the Farmers’ Market where they handed out reminders to “ save the date”. Up next is their annual Garden Tour showcasing Aurora in a more intimate way. Nine of their members’ own beautiful gardens will be open for visitors and their celebration will continue in special ways—you’ll have to attend to find out how. The Tour is from 12 noon to 4:30 PM, rain or shine. Tickets cost $15 . Complete information can be found at their website www.gardenaurora.ca. Next up in August will be a free Public Annual Flower Show on Saturday, August 11 in the Aurora Public Library from 12 noon until 4:00 PM to see what they grow here in Aurora and what their Champion floral artists can create with plant material. 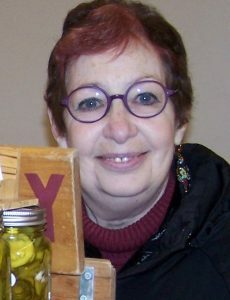 The Farmers’ Market has hosted Garden Aurora as well as other not for profits for several years. Here they can showcase their organizations to Aurorans who may not be familiar with them. It’s a meeting place where they have amazing conversations with visitors to their booth. People now expect to find them at the Market in the spring and it’s like rekindling old friendships. They provide education on all aspects of gardening at monthly meetings held at the Royal Canadian Legion. All are welcome to attend and learn from their speakers and members. To celebrate their anniversary, guests may attend the meetings for free. While the internet is great, nothing replaces the personal interaction between people sharing, talking and learning about something they love. Our next Special Event at the Farmers’ Market will be Strawberry Fest on Saturday, June 23. We will be entertained by an amazing band, Howlin’ Fine Music. There will be crafts for the children, a draw for a market bag full of goodies from the Market as well as free strawberries for our customers to sample. Be sure to include us in your plans for the day.